House with a private chef to ensure your taste buds are tantalised, a private butler to assist with whatever you may need and a private tracker to give you specialist knowledge about the bush and wildlife. chauffeur will transport you to the designated airport for a private chartered flight to Sabi Sands. From there another private charter will fly you to Tintswalo Manor House where you will meet EWT staff over cocktails while learning more about the EWT and their work. Enjoy dinner under the night sky at the Tintswalo Manor House boma. Day two: A full day in the bush with the EWT experts, supported by a wildlife veterinary team. You will accompany them as they track a pack of endangered wild dogs, the most threatened carnivore in South Africa. You will witness and participate in real-life conservation in action by fitting tracking collars, vaccinating and sampling these fearless animals. A lavish bush brunch with an African flair awaits you before you get to enjoy the incredible sights and sounds of the magnificent bush with a guided afternoon walk and an unforgettable evening game drive. and birds of prey experts, the EWT’s Andre Botha, who will demonstrate the methods used to trap, sample, ring and tag a variety of vultures and raptors. Then explore the wild with a guided bird walk before sitting down to feast on an al fresco lunch before winding down the day with an evening game drive. Finally, dine out to the sounds of the African bush under a starry expanse. staff, equipment, consumables and veterinary services. · Gate fees and permits. Full board and lodging at the exquisite Tintswalo Manor House for four people, for three nights. Join expert conservationists in a behind-the-scenes carnivore conservation experience with African vultures and Wild Dogs. 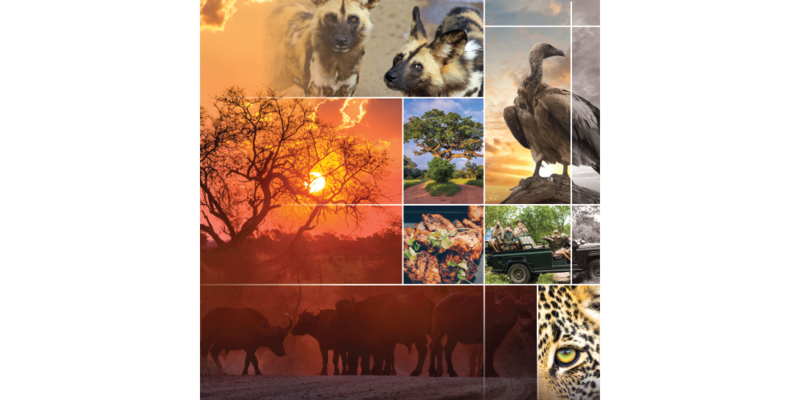 to Kruger National Park and the Endangered Wildlife Trust for continued conservation.